Sixth large DLC to the popular turn-based strategy of 2014. This is Endless Legend expansion pack. 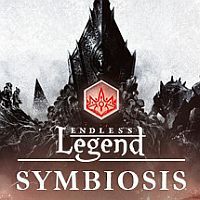 Endless Legend: Symbiosis is the sixth major addition to the 4X strategy. The expansion introduces a number of novelties and improvements to the game, including a new faction known as Mikara (characterized by unusual mechanics - can't settle in new areas, but can use them in a different way), as well as powerful, gigantic units - the so-called Urakny (Attractive). Developers from Amplitude Studios, the authors of Endless Space strategic series embedded in science fiction, are responsible for creating this title. Endless Legend: Symbiosis is the sixth major add-on to the 4X strategy. The expansion introduces a number of improvements and novelties to the basic version of the game. First of all, we get the original Mikara fraction. Its members come from an unusual core city and shape their economy on the basis of so-called hypertrophy, which they create in strategically important places. Mikara are not able to occupy areas, but after conquering a given city they have the opportunity to turn it into a ghost city, providing additional resources. With time, thanks to symbiosis, it also provides additional benefits. The second big - literally and figuratively - novelty in Endless Legend: Symbiosis are Urkany. These are giant beasts that occasionally appear in different places on the map, taking control of the area. Travelling the monster allows you to unlock a set of additional powerful skills (supporting both defensive players and those whose strategy is based on aggressive expansion). It is worth emphasizing, however, that this is not an easy task - success will require a great talent in battle or diplomacy. Endless Legend: Symbiosis does not add any new modes or campaigns to the game, but the new faction allows you to experience the existing content in a different way. Endless Legend: Symbiosis is a stand-alone add-on - it requires the basic version of Endless Legend to work. Expansion does not introduce any changes to the audiovisual layer.